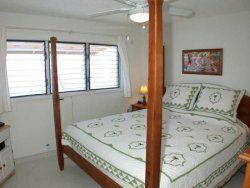 Our townhouse unit at the Keauhou Kona Surf and Racquet Club Resort is as close to the ocean as you can get on the Kona Coast. In fact this luxury, two-bedroom, two-bath, oceanfront condominium is so close to the ocean that the building has hatches and port holes to cover the windows when the waves are big! This luxury condominium is set in Keauhou Kona, a land once populated by the Hawaiian Ali'i (chiefs). On the north end of Keauhou and within walking distance of the townhouse is Kahalu'u Beach Park and the surfing bay used exclusively by the Hawaiian Ali'i for hundreds of years and today enjoyed by all Hawaiian and tourist alike. The south end of the resort is bordered by the 13th fairway of the Kona Country Club and the beautiful blue waters of the Pacific Ocean. 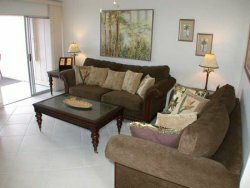 The condominium is decorated in Hawaiian-style furnishings with the living room, kitchen, master bedroom, and bath all oceanfront. The townhouse really feels like a home by the sea. The kitchen provides guests with all of the amenities and appliances to create your own meals right in the townhouse. You can enjoy your meals oceanfront on the lanai or at the game table in the dining room. The living room is decorated in Hawaiian-style furnishings and is spacious and bright. Plenty of comfortable seating is provided by a large sofa and love seat. There is an armoire entertainment center with cable TV, VCR, DVD, and a video library with dozens of films. 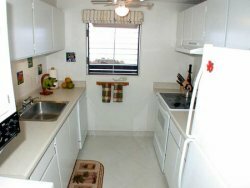 The unit also includes FREE wireless Internet access. The master bedroom and bath is absolutely oceanfront on the second floor. Amenities includes a king-sized bed with end tables, two dressers, ceiling fan, phone, cable TV/VCR, and a large walk-in closet. In the oceanfront master bath there are tiled floors and shower. The second bedroom is also on the second floor and faces the mountains. Amenities include two twin-sized beds, an end table, a six-drawer dresser, ceiling fan, and large windows. In the second bath located next to the entry on the first floor there are tiled floors and along with a full-sized shower. Resort Information - Keauhou Kona Surf and Racquet Club Resort is a four-star resort located oceanfront near Kahalu'u in the Keauhou area of Kailua-Kona, Big Island, Hawaii - approximately four miles south of the Kailua-Kona Town Center or the Kailua-Kona Pier. There are 197 total units with one-bedroom, two-bedroom, and three-bedroom units located oceanfront, ocean view, fairway front, and fairway view. The Keauhou Kona Surf and Racquet Club Resort is located in the center of the Kona Coast, the Keauhou area is known for calm winds and warm, sunny days because it is located on the leeward side of Mauna Kea, the 13,796-foot-high (above sea level) mountain that is the highest point in all of the Hawaiian Islands. In fact, if Mauna Kea's height is measured from its base (18,000 feet below sea level), it surpasses even Mount Everest as the world's highest mountain (31,796 feet) Before modern times when the trade winds were blowing cold winter air down from the northeast, the Hawaiians would travel to the Keauhou Bay area for shelter and warmth. 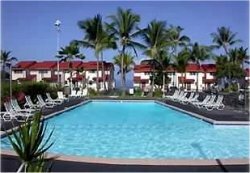 Resort features include FREE parking for all guests, a large swimming pool, three lighted tennis courts, historic Hawaiian landmarks, two charcoal barbecue grills, and a picnic areas. See our Kanaloa at Kona Photos page for pictures of the resort and amenities. This is no front desk at the Keauhou Kona Surf and Racquet Club Resort and many of the other units at the resort are rented directly by owners, like the condominiums on this website, while others are rented through local property management companies or the owners do not rent them at all. All amenities at the resort are available to resort guests and the resort is within walking distance of golf, tennis, SCUBA, snorkeling, shopping, cinemas, and restaurants.